Ryan Blaney and the No. 21 SKF/Quick Lane wrote another chapter in their storybook 2017 season by winning the pole for Sunday’s Can-Am 500 at Phoenix Raceway. It was Blaney’s second career pole and the 118th for his Wood Brothers team. Thanks in large part to their alliance with Team Penske, Blaney and the Wood Brothers team have emerged as one of the sport’s teams to watch. They’ve won a race, at Pocono Raceway, made it to the Round of Eight in the Monster Energy Cup playoffs and now have two poles and three other front-row starts, including one at Phoenix in March. Blaney’s No. 21 SKF/Quick Lane Fusion was among the fastest cars all day on Friday at Phoenix. He was fifth fastest in practice with a best lap at 136.867 miles per hour. He was fourth fastest in the first two rounds of qualifying, posting speeds of 137.122 mph in the opening round and bumping his speed up to 137.573 mph in the second. His pole-winning lap was faster still, at 137.942 mph, and it gives him a head start on collecting the much-needed stage points he’ll need to score if he hopes to advance to the championship round of the Monster Energy Cup playoffs. 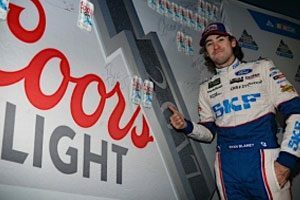 “We got better each round, which is all you can ask for really,” Blaney said. “I thought the last round was our best. We ran our fastest time and it was enough. “That says something strong about this team. We started second here in the spring and to back that up and better it at a big weekend like this, where we have to perform well, that’s definitely encouraging and it gets our weekend started off on a good foot. Blaney enters the Phoenix weekend sixth in the standings, 22 points away from a berth in the final round of the playoffs, which will be the premier event at next week’s Ford Championship Weekend at Homestead-Miami Speedway. He said it’s possible to make the final playoff round on points, but he likely needs a win to be in. “You never know what can happen,” he said. “If you go and you get a good couple stages in, you and the 11 [Denny Hamlin] or the 2 [Brad Keselowski] don’t have very good stages, you might be right there. “You never know how it’s going to be. You just kind of assume those two cars are in the positions they are for a reason – because they run up front every single week. You just kind of realize the situation that you’re in and where they’re running, but it is possible to point our way in, but I’m not really banking on that. 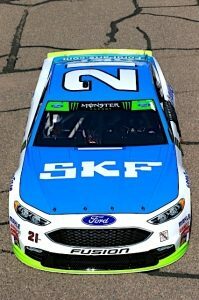 Blaney pointed out that the immediate challenge is working on the SKF/Quick Lane Fusion in Saturday’s practice to prepare it for Sunday’s race. “It was really cool outside when we qualified here tonight, and it will be really hot on Sunday,” he said. “We usually see long green-flag runs here and try to keep everything cool – brakes and tires and things like that. “That’s kind of the opposite of what you want to do in qualifying. You’re trying to get everything in one lap, so we’ll see where our car is. The Can-Am 500 is set to get the green flag just after 12:30 p.m. (2:30 Eastern) with TV coverage on NBC.